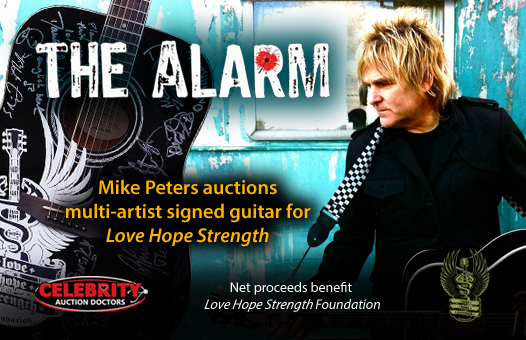 Studio City, CA – Mike Peters, singer of renowned alternative rock band The Alarm and co-founder of cancer charity The Love Hope Strength Foundation, will auction the very guitar he played on the new interview-and-auction show Celebrity Auction Doctors. The Gibson Epiphone guitar was signed by members of popular 80’s / 90’s bands including The Alarm, Guns N’ Roses, Motörhead, The Cult, The Stray Cats, The Fixx, The Damned, Gene Loves Jezebel, The English Beat / General Public, Fastball, and The Living End. Fred Armisen from the television series Portlandia has also signed the guitar. 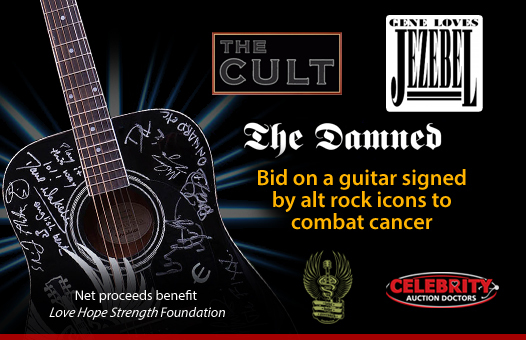 The guitar will be auctioned live worldwide from January 29 through February 8 at CelebrityAuctionDoctors.com. The show is done in partnership with eBay’s charity division Giving Works. 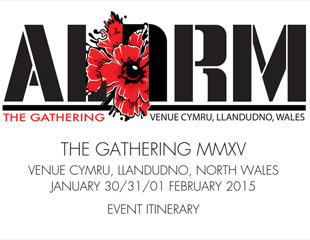 Mike Peters’ candid interview and the auction will be promoted and shown at The Gathering, which is The Alarm’s annual three-day concert fan-fest in their home country of Wales. 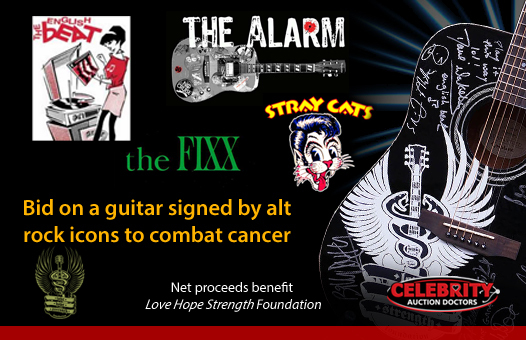 Mike Peters will personally congratulate the auction winner by phone. 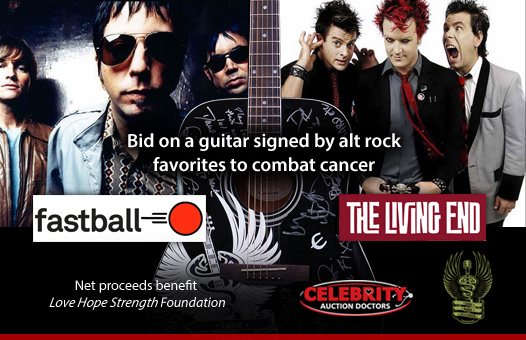 Net proceeds from the auction will benefit The Love Hope Strength Foundation (lovehopestrength.org), an organization created in 2007 by Mike Peters and fellow cancer survivor James Chippendale that is “Saving Lives One Concert at a Time.” The charity’s mission is that everyone, everywhere deserves access to quality cancer care and a marrow donor if needed. They have taken world-famous musicians to extreme locations like Mount Everest, Manchu Picchu, Kilimanjaro, and Mount Fuji, performing fundraising summit concerts to build and provide cancer centers with life-saving equipment, training, and support, and now have successful projects in the Holy Land, Wales, Nepal, and Tanzania. 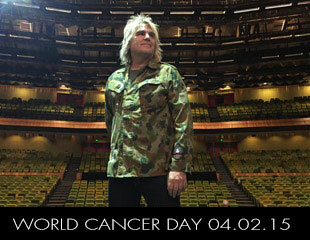 In addition, they host marrow donor drives at concerts and festivals across the UK and USA. Over 1,500 drives were conducted last year alone. Successes include registering over 100,000 new marrow donors and finding nearly 1,500 potentially life-saving matches. Celebrity Auction Doctors is a new program created by the company Auction Doctors, Inc. which has organized global charity auctions for more than ten years for national organizations. The company founded Celebrity Auction Doctors as a promotional vehicle for charities and celebrities. The marketing power of Celebrity Auction Doctors is found in the combined social media presence of the celebrities and the charities. Celebrity Auction Doctors features stars from many different worlds including: film, television, music, art, politics, sports, and more. Guests on Celebrity Auction Doctors raise money and awareness for their charities of choice. 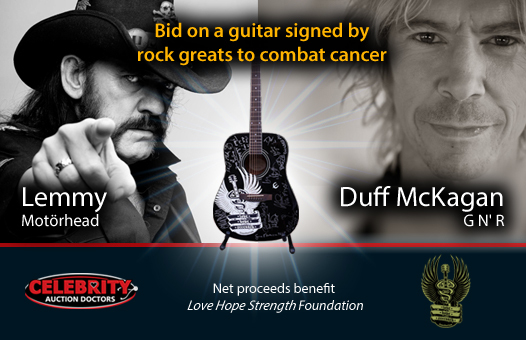 Celebrity Auction Doctors only supports 501-c-3 charities with proven integrity.